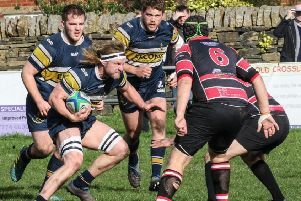 Heath need only one win from their three remaining games to clinch second place in Yorkshire One after a hard-fought 29-25 win at Dinnington yesterday. Defeat for third-placed Pontefract at Selby leaves Dave Harrison’s side with a 12-point cushion over their West Yorkshire rivals in the quest for a likely promotion play-off game behind Moortown. Dinnington had lost only once before at home this season and they twice fought back after Heath had built 15-3 and 29-15 leads in an enthralling, entertaining encounter. Heath, who had the experienced Eddie Cartwright returning at full back and Dave Skinner at prop for the unavailable Chris Piper, came under pressure and conceded penalties early on but their defence held firm. The visitors hit back but Dinnington held out until the hard working Michael Reynolds broke free and the supporting Dan Cole quickly fed Ezra Hinchliffe. The centre scythed through a static defence before releasing wing Luke Saltonstall, who raced in at the corner. Hinchliffe added the extras. This seemed to spur Heath and forwards Richard Brown, Alex McFadden and Fergus Marsden drove into the home defence, followed by Reynolds, Brown and Cartwright. It came as no surprise to see Heath increase their lead to 10-0 with a Hinhcliffe penalty after 25 minutes. Dinnington reduced the arrears with three points from the boot of Jonny West, before Heath responded with another superb try. Chris Moore and Jonny Cole made ground in the Dinnington 22 and the on-rushing Hinchliffe released the ball to Cartwright, who in turn slipped a sublime pass to Callum Harriett-Brown. The wingman drove towards the corner and although he was held short, Hinchliffe was on hand to collect and extend the lead to 15-3 close to half time. Dinnington bounced straight back. Alex Patrick was sin binned, Heath were under the cosh and Neil Dunn scored and West converted to leave the game wide open. Dinnington still had the momentum and after going close a few times Simon Bunting went in for an unconverted try on 48 minutes a to make it 15-15. Dinnington continued to attack but when a Dan Cole pass found Cartwright, the full back’s clever kick towards the half-way line was chased by Harriett-Brown, who hacked towards the Dinnington try-line. The chase was on but it was the flying Heath wing who won the race, scoring under the posts. Hinchliffe converted with 54 minutes on the clock. This seemed to inspire Heath and when Chris Moore off-loaded to Cartwright the full back set off at full speed. He sent out a pass to Reynolds, who juggled before releasing Harriett-Brown. The winger sent in Issy Spooner for the bonus point try and with a score of 29-15 the game seemed over on the hour mark. However, Spooner was sin-binned on 67 minutes and the home side continued to press. With 10 minutes remaining winger Todd Bonsall scored in the corner. 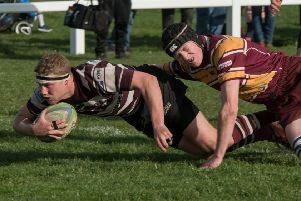 Dinnington then added their a fourth try through Robert Goodwin but West missed both conversions and Heath retained a four-point lead to the final whistle.